Reasonably inexpensive, so I could leave it in Africa when on my days off, and if some reason I didn’t return, I wouldn’t be too hurt at loosing it! The Benro A-158 fits most of the above requirements (don’t think I’ve ever used it with the 100-400mm lens though), and I still own this tripod. However it hasn’t seen an awful lot of field use to be honest, and I tend keep this now as a back-up tripod. I also purchased a cheap Benro head to use with it, but currently use this with an Acratech Ultimate ballhead. The tripod is pretty robust for it’s size and being aluminium also quite strong. Benro started out as a Chinese Gitzo clone maker, albeit with some slight design variations, but have moved on since. This looks rather Gitzo-ish and the twist leg lock grips are rubberised just like Gitzo’s and work well too. Whilst the fit and finish in not up to Gitzo’s high standards, it’s pretty good. However, getting a Benro tripod repaired could be a different matter (see what happened to my Benro C-298 tripod here). At the time of purchase in mid 2010 this cost around £65 so was pretty much a bargain. Although it folds up reasonably small, at 3.2 lbs I find it a tad too heavy for a travel tripod. Now discontinued, you may come across one on eBay. If the leg lock bushings are OK (see my Benro C-298 tripod review), and the price is right then this would make a decent back-up or starter tripod. 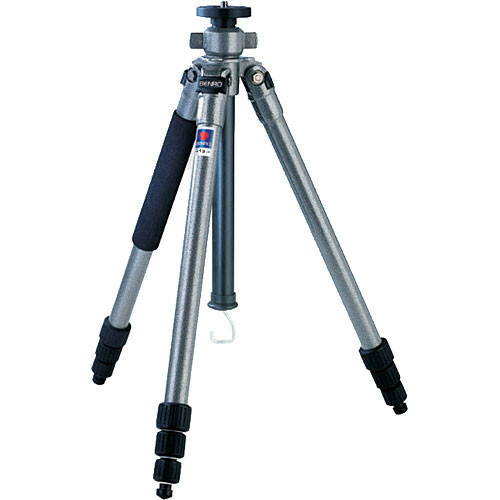 The Benro A-158n6 Aluminium Tripod is a sturdy tripod made of extruded 6000 series aluminium with a wall thickness of 1.5mm. It comes fully-featured and is precisely machined to offer the quality and strength demanded by professional photographers. A-series tripods feature individual leg angle adjustments, a reversible centre column with spring loaded weight hook, foam leg grips, anti dust and moisture rubber leg lock grips, reversible 1/4-20 to 3/8″ mounting threads, a bubble level, and mounting set screws. Improved dust- and rubber-resistant leg lock design prevents dust or moisture from entering the interior of the leg twist-locks. Three leg-angle settings (24,55 & 80°). Rubber leg tips provide a secure grip both indoors and outdoors. The retractable spring-loaded hook can be used to add stability with a sand bag or equipment bag.